Eben shared these thoughts and others in an interview with The Pi. Read on for his thoughts on his career’s arc, his favorite Pi projects, and the future of the world’s most important single-board computer. Of course, the disappointing thing about the Raspberry Pi offices [in Cambridge, U.K.] is that we don’t make Raspberry Pis there! We design them. …but then there are those days when I actually get to go to the factory [in South Wales] and watch units coming off the line. I probably get to do that four or five times a year, and those are always standout days. Raspberry Pi (Trading) has about 35 employees, of whom maybe 25 are engineers. That’s a mixture of software engineers, who write the operating software for the device, and hardware engineers, who design the physical product. Then there’s the Raspberry Pi Foundation, with around 80 employees. That’s a mixture of educators, people who run our curriculum work, people who run teacher training programs, people who run the Code Club after-school clubs, [and] people who run CoderDojo, which is another public network of coding clubs. Most of the Foundation’s employees are in Cambridge, but the CoderDojo team is based in Dublin. [Editor’s note: the merger of the U.K.-based Raspberry Pi and the Ireland-based CoderDojo happened just a few months ago.] And we have three people in North America, based in San Francisco. Decision-making for hardware features is kind of distributed. I guess I’m the final arbiter of what goes in, but I don’t have to arbitrate very often, because we have a great team. By and large, it’s obvious what we’d want to do: the high-level features kind of write themselves, because we have this very aggressive cost target of $35. So with those pricing constraints, it’s been a long time since there’s been any real debate about high-level features. If it was twice the price, there would be more freedom to choose, and likely more disagreements. On the technical side, it’s software. We tend to swing back and forth between hardware and software. We did the original design, then we did a couple years of software to squeeze performance out of that. Then we did the Raspberry Pi 2 and Raspberry Pi 3. And now, since we have a good, stable, performant platform, we’re focused on software again. The business side is about making the Raspberry Pi available in more countries. And on the charitable side, it’s finishing off rolling out our programs the UK. …and then overseas. Asking ourselves what aspects of what we do in the U.K. we can do in North America, in Germany, or in Africa. Well, I can tell you about who we hire, and who we don’t hire. You have to write your own computer programs. I mean, you see people coming in and applying for jobs who have never written a computer program that they didn’t have to write as part of a course. And you very rarely find someone like that who’s really good, really capable. The people who are good are the people who have some academic experience, but that also have the passion projects … the best people have that, the theoretical underpinnings but also practical experience. In terms of exciting new fields, they all depend on basic skills. I started off writing games, and now I run a company that makes hardware. But the basic engineering and analytical skills that are applicable to one are applicable to another. So – what’s hot right now? AI is hot right now, but who knows what will be hot in ten years’ time? So my advice to people starting out is to focus on getting the basic skills. They’ll be useful regardless of what’s hot. Take programming languages – people ask me what programming language they should learn. It doesn’t really matter: just learn one. One or, even better, two programming languages. Then you’ll be able to generalize. Both! As an employee of a large company you have access to enormous resources, if you can win the argument about how they should be deployed. But as an entrepreneur, you have access to the autonomy which is only available to the top employees of a large company For any given task, there’s a trade-off. And the way things work at Raspberry Pi, I get to do a little bit of both. I’m going to say both again [laughing]. We have a great team, so I don’t have to do all the technical stuff (not that I ever did, even in the early days). What I’ve really enjoyed the past year is seeing what [users] do with AI… there was a Japanese guy whose parents had a cucumber farm and was taking the cucumbers in a box and categorizing them. And there were something like 23 different categories of cucumber, based on how fresh they were, how big they were … how many lumps they had on the outside of them. But he took TensorFlow [Google’s machine learning software library] and taught it to recognize the cucumbers… all using his mother’s classification. And after a while he trained it. And it was pretty good! So that’s kind of example of the AI stuff, what’s next. It’s good that there’s diversity, right? I mean, there’s some part of you that would want that industry to yourself, but I think every other new product that appears drives us forward. We continue to think about accessories. We already have the camera, and the display, and of course the Sense HAT, which went to the ISS with Tim Peake – it’s really fantastic that we can say that – but we continue to think about accessories. There’s not anything in particular coming in the near future, but we’ll keep looking at that. I think this is a question that is going to come up over the next several years. We know what the asks are: more memory, more processing power, more communication bandwidth… You know – more. So I don’t think you’ll see any discontinuity in our product roadmap. So I think what you’re likely to see in the future of Raspberry Pi is us doing what we do, but more of it. 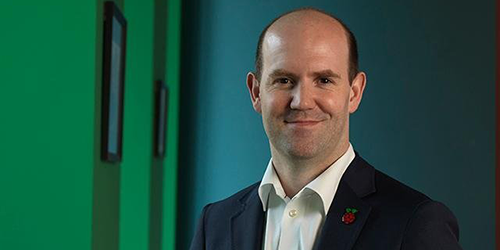 Be the first to comment on "Interview with Eben Upton, CEO of Raspberry Pi (Trading) Ltd."